Ford’s redesigned F750 truck via Ford Motor Co.
U.S. retail sales of medium-duty trucks rose 13.7% in May to 20,801, driven by large gains in demand for Class 6 trucks, a highly competitive sector. Sales of Class 4 through Class 7 trucks a year earlier hit 18,302, according to WardsAuto.com, which reported the results June 13. Year-to-date, sales have climbed 7% to 94,628 compared with the same period a year ago. These sales indicate that more than just the lease and rental companies are pulling forward demand for medium-duty trucks, Steve Tam, vice president at ACT Research Co., told Transport Topics. Tam said he raised his medium-duty production and sales forecast slightly as a result, for the first time in six months. Class 7 posted a 9.7% gain, climbing to 5,390 units. Freightliner, a unit of Daimler Trucks North America, cinched a 53% share, selling 2,880. Class 6 sales soared 27.9% to 6,141 trucks. 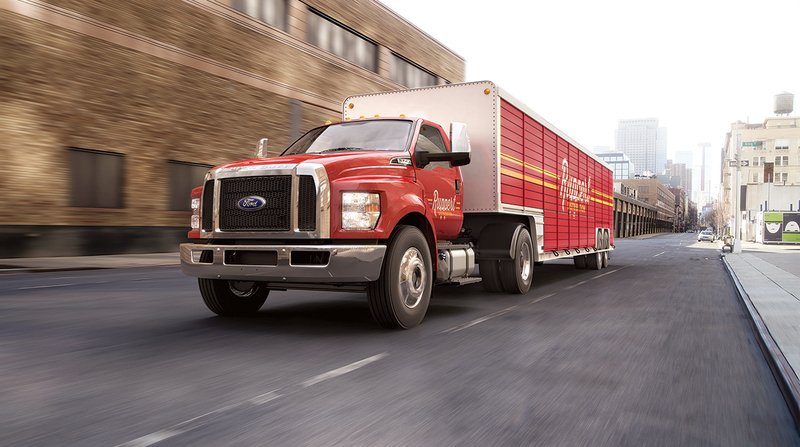 Ford Motor Co. with 1,962 sales, edged out Freightliner, with 1,720, for the top spot. International took the third spot, selling 1,354. Class 4 through Class 5 sales rose 8.5% to 9,270. Ford dominated the Class 5 segment with sales of 4,601. Isuzu Commercial Truck of America sold the most Class 4 vehicles, 1,248. In related news, Navistar reported in its latest quarterly earnings call that it will start production on the Class 4 and Class 5 CV model at the end of 2018. “It delivers in the early next year,” Persio Lisboa, Navistar’s chief operating officer, said during the call June 5. The CV models are a collaboration between Navistar and General Motors Inc., which has been out of the medium-duty sector since 2009. The frames are Navistar’s and it will build the trucks at its Springfield, Ohio, plant. Also, Eaton Cummins Automated Transmission Technologies expanded its medium-duty application coverage for the Procision 7-speed dual-clutch automatic transmission to include utility, construction, tanker, refuse and municipal trucks in Class 6 and Class 7. Procision features IntelliConnect, a telematics-capable system. More medium-duty fleets are using telematics to help reduce unplanned downtime, according to the company.